There has been quite some fuss recently about the new UK version of the Monopoly board featuring where the prestigious places on the board went to St Albans and Exeter! 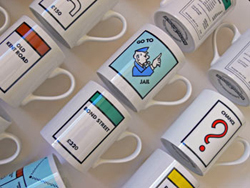 But to my mind, the classic London version really can’t be beat, so I was delighted to find these Monopoly Mugs. There are 18 designs to choose from, including Go To Jail, Electricity Company, Waterworks and a selection of the streets. New Rooms Online is selling them for £5.75, which means for once Park Lane costs the same as Old Kent Road.